Thank you for using the Apparel Search website. Pantone Color of the Year 2016 is both Rose Quartz and Serenity. 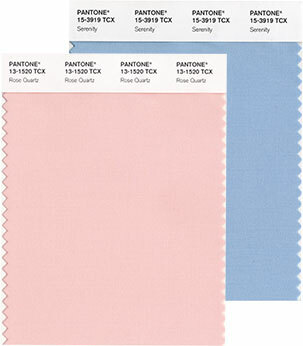 For the first time Pantone introduces two shades, Rose Quartz and Serenity as the PANTONE Color of the Year 2016. Rose Quartz is a persuasive yet gentle tone that conveys compassion and a sense of composure. Serenity is weightless and airy, like the expanse of the blue sky above us, bringing feelings of respite and relaxation even in turbulent times. The prevalent combination of Rose Quartz and Serenity also challenges traditional perceptions of color association. Pantone went on to explain, “In many parts of the world we are experiencing a gender blur as it relates to fashion, which has in turn impacted color trends throughout all other areas of design. This more unilateral approach to color is coinciding with societal movements toward gender equality and fluidity, the consumer's increased comfort with using color as a form of expression, a generation that has less concern about being typecast or judged and an open exchange of digital information that has opened our eyes to different approaches to color usage”. Pantone LLC, a wholly owned subsidiary of X-Rite, Incorporated, is the world-renowned authority on color and provider of color systems and leading technology for the selection and accurate communication of color across a variety of industries. The PANTONE® name is known worldwide as the standard language for color communication from designer to manufacturer to retailer to customer. Learn more about the 2016 Pantone Color of the Year at the Pantone website. View more Pantone Color of the Year selections here on Apparel Search. Copyright © 1999-2019 Apparel Search Company. All Rights Reserved.